Cosima delivers an exceptional lesson experience and ranks in the top 15% of our teachers nationwide. As an active performing vocalist, musician, songwriter, and Christian worship artist and band leader, I understand the demands and challenges of a busy performance calendar, singing sets for back-to-back audiences day after day and week after week, and the need for a vocalist to find the vocal freedom that will produce confidence in their voice no matter what the venue. Associate instructor of online live-chat lessons; vocal, guitar ukulele and songwriting. Private Home-Studio Owner: Voice, ukulele, guitar and songwriting. Vocal workshops and conference clinician. Customized clinics and workshops on location. Organize, prepare and oversee technical and musical aspects of worship services and special events, plan worship sets and lead practice sessions. Lead band musicians and vocalists and give vocal instruction. Direct adult and children's choirs, and a cappella ensembles. Responsible for developing and raising up new musicians through conducting workshop, seminars and one-on-one instruction. Certificate of Completion, Contemporary Voice Teacher Academy. Successfully completed all coursework and testing in contemporary voice teacher training. Certificate of Completion, New Science of Singing. Successfully completed all coursework and testing in the New Science of Singing Course. Last month it was "Annie." Today Chloe sings RaeLynn, tomorrow Ariana Grande! Only 11 & super talented! 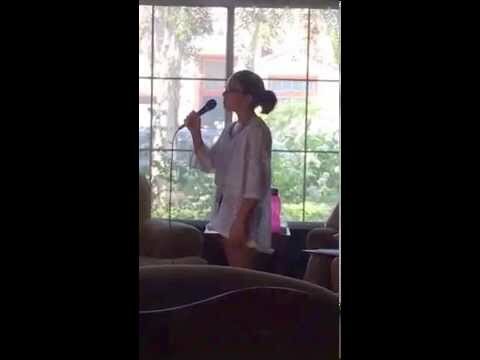 Vocal student, Mary, music video. This short clip isn't the best quality nor is it mixed very well (listen closely for the Tenors and Basses). It was taken with a phone but despite the poor quality it represents some of the fun my students can have when they venture into singing SATB for the first time. This little a cappella ensemble of 10 prepared for about 8 weeks to present at the 2012 Calvary Chapel Perris Valley Christmas Concert. Enjoy and Sing On! A capella choirs and ensembles. Making music with others is not only fun but it's also good for your health, physically, emotionally and spiritually. Learn to play and sing! Instrument rentals available! We love Mrs. Cosima. She is very nice, has good sense of humor, flexible, on time. My daughter has learned good singing techniques. This was the first lesson. There was a lot of education, but it seems important to understand the process. Looking forward to the next lesson. She made my daughter feel very comfortable. Looking forward to more classes. I have had my first few lessons with Cosima and she has been absolutely amazing. I am a beginner and she has made me feel comfortable throughout the entire process. Very professional, informative, and dedicated to her students. I look forward to more lessons with Cosima. Very understanding, thoughtful, but does not waste time. Gets right to teaching techniques for your voice and your singing weaknesses. Also, takes her time to make sure you understand what she is saying and teaching. Efficient, effective, and fantastic. Cannot recommend enough. My teenage daughter is a bit shy. When she started with Cosima she had a nice, but untrained voice. Cosima has done a lovely job helping her to refine her voice and gain confidence. I know Cosima's teaching helped my daughter get into her very competitive High School choir. Cosima is a gem. First lesson, I liked how she started with explaining the different parts of singing. Chest, throat, nasal, and head. I think I am going to like this. I am so glad that I had the privilege of meeting Cosima and having her as my singing instructor. Singing is something that I always loved and still do, so I was nervous to show my flaws, but Cosima was always very encouraging. She listened carefully and always tried to find a way to help me reach what ever goal we were working on. Even though I had so much trouble with my voice she never gave up on me, she always tried to figure out different exercises that would help me out. She always asked what she could do better as an instructor to help me reach my goal. One thing I loved receiving were my lesson notes, because I could look over them and remind myself on what I needed to work on. She is extremely understanding! And very patient! I miss my lessons with her! She is the most wonderful, down to earth person and is great at what she does! I lost my singing voice after being hospitalized. Cosima has brought my voice back and beyond what it used to be. She has helped me overcome decades of poor singing habits. What a blessing. Cosima is outstanding! My daughter loves her lessons is learning a lot! I recommend Cosima to anyone. Thank you Cosima. I feel much more confident singing in front of people. I loved your positive, supportive guidance and feel like you've taught me how to keep improving even though my schedule does not allow me to take lessons at the present. I have never taken one on one lessons but when I was blessed with the opportunity to join my church's worship group I knew that I wanted to seek professional help. I look forward to our lessons together. and will encourage any student out there that is looking for a professional but also a person who cares about your singing growth and ability, to take Cosima as your teacher. you wont regret it!! Great Vocal Instruction, Great Teacher! Cosima is professional & cares about her students progress! I had gave up on singing, she was my last attempt. My vocal ability has grown so much with her instruction. My passion for singing has grown even more since she has taught me how to sing and use my vocals properly. I have been making steady progress since the beginning. I look forward to our lessons, I love to sing! I feel that's its never too late to start singing, I believe she can help anyone become a singer! Thanks Cosima! Comsima is an excellent instructor. She is always giving me positive feed back and is always willing to work around my busy schedule. I'm blessed!!!!! Cosima is one of the most down to earth vocal coaches I have ever met, one who truly wants to see her students become the best they can be. After overcoming my fear of singing in front of a crowd, I decided to join the worship team at my youth group. With this decision I also got the privilege of taking vocal lessons with Cosima. She immediately makes the environment comfortable and reassures the student that no one is perfect and mistakes happen to the best of us. I cannot count how many times I have compared myself to other singers, and Cosima is always there to remind me that the voice I have is more than enough. Cosima also establishes a friendship with each of her students. She came to my first big performance at my high school talent show, which was something that I will never forget because it showed me how much she cares. Her instruction is easy to understand and always beneficial to the student. Yes, I even tackled those high notes that I would normally not even attempt. I recommend Cosima to anyone who is not only looking for a vocal teacher, but for someone also looking for someone who wants to see you succeed and will be there for you every step of the way. I cannot thank Cosima enough because she has helped me become the more improved tenor I am today. Cosima was there to help just when I needed it! I was in town for only a few weeks to play a role in a musical production of the Book of Esther. Cosima was there to help just when I needed it! She took me as her vocal student at the last minute and helped me work out some weak areas and insecurities I was having with my voice. Cosima is knowledgeable and able to see into your voice to help you get right to the issues you are dealing with. Her kind manner and energy helped me feel secure and ready to tackle those high notes and work on other weaknesses. When we were finished I felt as though I'd known her forever and my singing had improved greatly. I'd recommend Cosima to anyone interested in getting over some vocal issues and to those who are just starting out.